View of Mill Lane Cambridge, a small lane off Trumpington Street. It is near the banks of the River Cam which runs through the city. 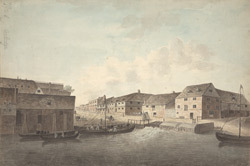 This drawing shows it was a busy area of the town, with barges arriving, docking and loading and unloading goods.